I started the GAPS diet because our celiac son wasn’t 100% better just being gluten-free. Friends who had done it told us it would help, and reading about it, I did seem to have some of the GAPS issues, too. I didn’t think it could hurt, but didn’t expect any improvement over my previous normal state, either. Boy was I in for a surprise. Over the years I’d accumulated a number of annoying health issues. None of them seemed all that serious. When I asked my doctor about them they’d run a few tests and write them off. Sometimes, they’d suggest a drug that might alleviate symptoms. After a couple months on GAPS, I realized that many of those issues had resolved themselves. Every now and then one has come back, but it’s been pretty easy to figure out what was causing it because we introduce new foods slowly. The past month, though, I’ve been having a tough time. We had a couple trips and had a lot of extra things to deal with around the house. TinyHands got out of the routine of making yogurt and soaking and dehydrating nuts. I wasn’t eating cheese, eggs, or beans, though the rest of the family was, and found myself snacking on fruit too much. I felt that I didn’t have enough options. I’d start feeling better physically, then eat something I knew wasn’t working for me, just because it was there. I’ve decided to revisit intro. It’s hard to stick to basically just soups when there are other options all around me, no matter how much I like what I have to eat. (Rosemary-lamb soup for breakfast today… yum!) In the interest of reminding myself why I need to do it, here is a list of my symptoms and the causes I’ve identified. Rancid Breath – I had chronic bad breath. I asked the doctor and the dentist, neither had answers that helped. My bad breath comes back when I eat cheddar cheese! Sugar may be a culprit as well. My gluten challenge has shown that the rancid breath and bad BO are caused by it as well. Bad Body Odor – This one goes right along with the bad breath. Dandruff – Same deal with the dandruff! Migraine Auras – I used to get migraine headaches occassionally, and auras at least every couple weeks. I’d have visual disturbances, lose parts of or all of my vision. I’d get odd and painful tingling sensations traveling my arm, hand, face and tongue. I’d get verbal aphasia (saying something other than I thought I was saying). I’d go weak and feel nauseous and exhausted. I’ve only had 3 mild migraine auras since starting GAPS 8 months ago, and no migraines! Once I was extremely stressed out, the other time I’d eaten new foods that I’ve been able to have since without a problem. Last week I had one for the first time in about 6 months. I’m not sure what the issue is here, only that I’m much better off than I used to be. Nighttime Parasthesia – I used to wake up with parts of my body asleep. My arms, legs, hands, and parts of my torso would all be asleep. My hands would also be numb and weak. I got tested for MS over these symptoms. After a while on GAPS, these symptoms all went away. When I started snacking on fruit before bed, the symptoms returned. I’ve discovered this is caused by hypoglycemia. 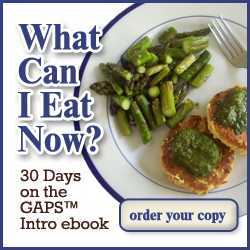 The GAPS diet, in general, keeps blood sugar on a much more even keel. When I started spiking my blood sugar before bed, I’d wake up hypoglycemic! Sticking to protein before bed has resolved this problem. Constipation – I always tended toward constipation. As a kid I learned that more fiber was the answer. Surprisingly, this low fiber diet has actually resolved this problem! Uncontrollable Diarrhea When Stressed – This problem started for me after a particularly bad illness about 6 years ago. After I got better, my digestion stayed messed up. I don’t have to tell this symptom was miserable. I’m still surprised that I just don’t have to worry about where the nearest toilet is any more. Unfortunately, as I became more lax about the diet this month, I’ve had reactions that have sent me back to the bathroom. Getting Up To Pee All Night Long – I thought my need to wake up and go to the bathroom a million times a night had to do with one unfortunate incident where I wet the bed many, many years ago. Obviously I had no interest in repeating that experience. But it turns out that GAPS changed this for me! Gas and Bloating – It didn’t take long for my gas and bloating to go away. I really thought it was normal, but it turns out when I am on GAPS I hardly have it at all. Now I’ve noticed it comes back when I eat eggs. This is a little weird, since I was able to eat eggs without gas and bloating when we were still on the intro diet. I do seem to be able to reintroduce eggs in small quantities when I am eating a lot of broth and basically doing Stage 1 GAPS otherwise. We’ve recently introduced beans, and those have brought the gas back, too. I need to stay away from them. Herpes Outbreaks – When I first got Herpes, I had long, frequent outbreaks. Over the years they subsided, and usually I only got them if I was very stressed out or ate nuts or too much wine and cheese. I eventually found medication that would help, and used to take it to head off outbreaks when I felt them coming on about every 6 weeks. Since being on GAPS, I’ve only had two outbreaks. The first time, I took my medication but found myself reacting to the fillers with brain fog. The second time, I just didn’t take the medicine and it resolved within a week. Nuts, wine, and (aged, hard) cheese no longer trigger outbreaks, and stress usually doesn’t, either! I’ve also noticed, since starting the GAPS diet, that I have new symptoms when I get certain foods. I didn’t notice these before, but I have either uncovered an issue or created a new one. Itchy Skin – This one pops up when I eat sugar. Brain Fog – Technically, I used to get brain fog and fatigue, but it wasn’t a complaint of mine. Now I notice the feeling when I get “glutened” or exposed to processed corn. Lastly, there are other things that have changed about my body. I lost 20 lbs pretty much right away and have maintained my new weight. If I were any thinner it would be a problem, but I am now the size I was before having kids. My skin is much better, it used to be dry and flaky and prone to breakouts. Now it is much smoother and healthier looking. Going back to intro is worth it, but it’s hard for me to accept that the rest of the family has been able to introduce more foods than I have. I’m still in a bit of denial that there could be anything wrong with me, or that I might have a more damaged gut than my celiac kid! I don’t have obvious, serious problems that someone can look at me and see. I don’t have imbalances or diseases that show up on standard blood tests. But I do know how to feel like crap, and I do know how to feel better. The choice is obvious, isn’t it? Update: I got back to feeling mostly better with GAPS intro over the course of a month. However, looking back at the genetic info from my kids I saw that I do have a genetic risk factor for celiac. I wanted to untangle the puzzle of whether celiac is a part of what’s going on with me. So I did a gluten challenge in order to be able to get valid test results. I had to quit early due to mental health issues triggered by the gluten. My tests were negative, but the challenge was so miserable that when it is over no one has to worry about me trying gluten again! I’m going to throw this out there. I’ve been researching writing a layman’s guide to probiotics and gut health for the past 3 years. My guess is that you have a microflora imbalance. You exhibit a lot of symptoms of caused by overgrowth of pathogenic bacteria and yeasts. Bad breath and body odor are 2 common symptoms of imbalance that can frequently be corrected by the species lactobacillus acidopholus (our good friends that make yogurt). It’s possible you may need a direct microflora implant into your intestines to resolve most of your symptoms permanently and completely. Good luck. Yeah, I’d say my gut flora is definitely out of whack. I do eat a lot of probiotic foods and they definitely help. After my gluten challenge is over I’m going to go back on intro and see if I can’t get back to a better balance. Thanks for the suggestion, and do let us know when your guide is out! Isn’t intro gluten free? Just confused I guess. I have also been struggling with accepting my food issues too, but the Lord is quick to get me back in line!! lol From what I understand about Gluten, is that you don’t have to have an allergy but an out of wack gut.. Since Gluten is so hard to digest and it is by far one of the most incredible flora feasts to create a breeding ground for micro flora. So therefor being a GAPSter and having a leaky gut, while breeding gazillions of bad toxic flora, all those toxins are being introduced into your blood stream basically poisoning you. So as far as I understand gluten is a solid no-no for a gapster and if any, very WELL fermented sourdough breads not to be introduced until a lot later in the diet. So when did you start introducing gluten into your diet again? YES! GAPS is completely gluten-free, though my personal opinion is that Dr. Natasha doesn’t go far enough in having people totally eliminate gluten cross-contamination. I also think people should get screened for celiac disease before undertaking GAPS, because when you get to reintroducing foods after a couple years on the diet it’s important to know how careful you really need to be about cross contamination. I only reintroduced gluten (after a year gluten-free and 9 months on GAPS) because I undertook a gluten challenge so that I could be tested for celiac disease. It was a horrible experience that I do not recommend to anyone. I’ve been back on GAPS for two months now and still have not recovered fully. Yeah, I was reading about your experience! Scary! Glad you gave up. Well now if you are able to eat gluten again you can have a great testimony!